The federal tax code allows homeowners to write off mortgage interest payments from their income before calculating their tax bill. Although it’s old news for tax- and housing-policy wonks that homeowners are getting federal subsidy payments, it may surprise others who assume that the federal government’s housing assistance goes mostly to low-income renters. The mortgage interest deduction adds up to a lot of money – an estimated $131 billion in 2012. That dwarfs total spending by the Department of Housing and Urban Development (under $50 billion). The biggest tax benefits go to high-income homeowners who’ve taken out big mortgages for expensive homes. Recent results from the Urban Brookings Tax Policy Model show that means affluent white families living in the suburbs, not the low- or moderate-income people who are struggling to buy homes or make ends meet or the central city neighborhoods that need reinvestment. For decades, low-income housing experts and advocates have argued that the mortgage deduction should be scaled back or restructured and that the extra tax revenues should go to housing programs that help poor people. There’s ample evidence of enormous need. But the mortgage interest deduction has been too popular among affluent homeowners and the real estate industry to touch. Now, however, the federal debt crisis may intensify pressures for increased revenue so much that even the mortgage interest deduction gets serious consideration. Next week, tax policy experts, housing advocates, and real estate industry reps meet at the Urban Institute to debate the deduction’s future. What should that future look like? Should we just eliminate the mortgage interest deduction to raise more revenue and simplify the tax code? Some may argue that the tax code should be purged of social policy incentives, but I think that’s unrealistic. Instead, if we’ve finally got a real reform opportunity, let’s redirect at least some of the tax savings from the mortgage interest deduction to help families and neighborhoods with serious housing needs, rather than the richest homeowners in the affluent suburbs. My name is Scott and I am the webmaster of some several finance sites. I came to know about your Site:blog.metrotrends.org through search engines while surfing. I found your site interesting as well as informative for my visitors. I am interested to exchange our visitors through doing guest post/content exchange. It will be mutually beneficial for both of us as the uploading of fresh content will help both of our sites to have more number of Google indexed pages. It will gradually boost the ranking of our sites in search engines. I'd just like to point out that those who take itimized deductions (to include mortgage interest) do not get the standard deduction. The real amount would be the difference between the mortgage interest deduction and the standard deduction. Also, those with expensive homes are likely paying a lot in property taxes, although to local and state governments. This more or less makes sense, does it not? The wealthy benefit the most from almost every tax deduction, including the charitable donation tax deduction, 401k deductions, capital gains deductions, etc. So is this really an attack on the mortgage interest deduction, or on deductions generally? 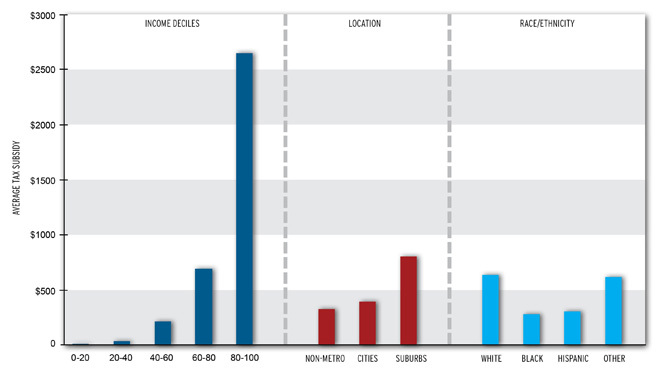 And since white people in suburbs are benefiting the most from the mortgage interest deduction, is this a reason to eliminate it -- or can this fact be impetus for improving housing availability for middle class minorities and for enhancing the livability and desirability of our cities ? Perhaps our history is not what we were told it was in school. Journal of Marital and Family Therapy, 36, 431-435.
consumption and another for those with "need to know".